With a combination of skin care, luxurious fragrances and a rich, creamy lather, you can turn every shower into an indulgent spa experience at home. Spongeables are revolutionary sponges and buffers infused with soaps, gels and skincare ingredients for all-in-one cleansing, exfoliating, moisturising and massaging. No other skin products are necessary. 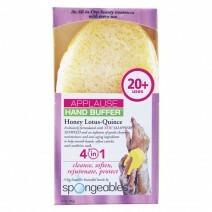 Each Spongeables is formulated with everything needed for healthy, beautiful skin. 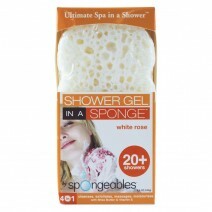 Thanks to their patent-pending infusion process, Spongeables give you over 20 pleasurable uses. They are a piece of luxury for your every day, and ideal companions to take travelling. Enjoy some rewarding indulgence while away from home for work, or be pampered on holidays for a truly relaxing experience. OLIVE OIL – The perfect hydration for all skin types. GLYCERIN – A gentle cleansing agent that prevents moisture loss and helps skin maintain a positive moisture balance. SHEA BUTTER – The optimum daily moisturiser for dry skin. VITAMIN E – A natural healing antioxidant that helps prevent premature ageing and skin damage. Spongeables are paraban-free and never tested on animals. Use the silky side of your Spongeables sponge to cleanse and moisturise, and flip over to the scruffy side to exfoliate and polish your skin. Enjoy rejuvenated, beautiful skin all over your body with a Shower Gel Sponge in White Rose or a Shower Gel Sponge with Buffer in Lavender. 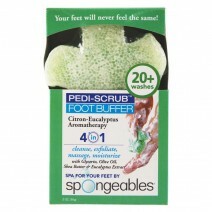 Meanwhile you can focus on refreshing your tired feet with a Pedi-Scrub Foot Buffer in Citron Eucalyptus, and keep your hands clean, soft and youthful with an Applause Hand Buffer in Honey Lotus Quince. Try some today!